we finally have a home for our old sideboard.. hurrah! when we moved into our house we were lucky enough to be given this beautiful piece from james' nan. unfortunately it's far too big to fit in our living room so it's been stuck in limbo in our spare room (aka the storage dump zone) until we cleared some space for it. I had another incentive for moving it, the arrival of some super cool accessories from flaming gifts. 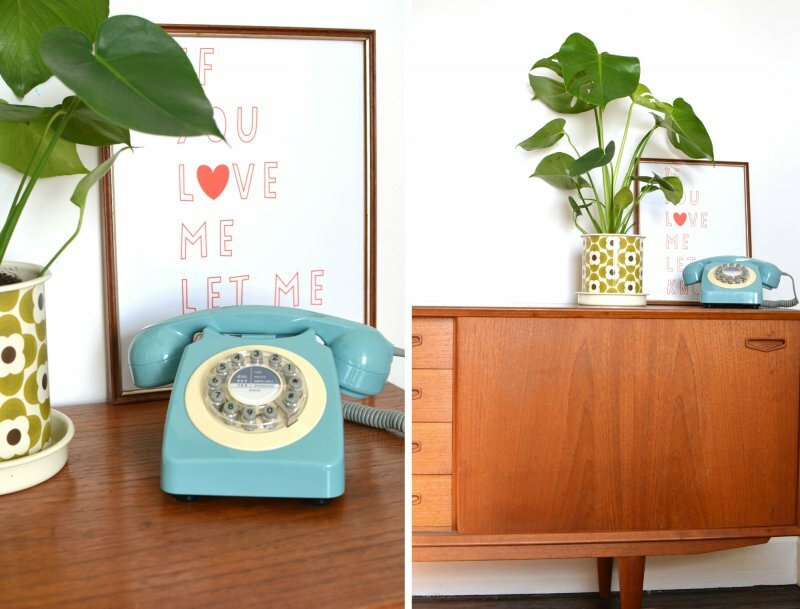 as soon as they arrived I knew their retro vibes would fit in perfectly on the sideboard so I was determined to make a space to display them properly! 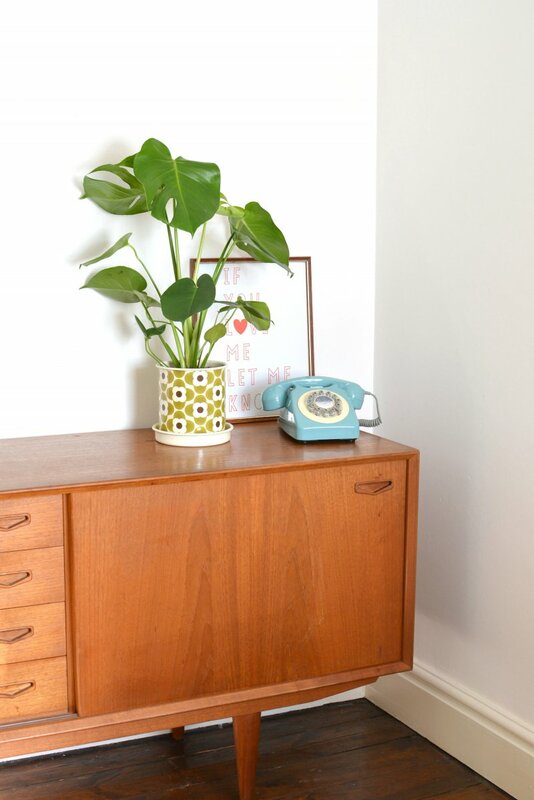 the 1960's design telephone is something I'd wanted for a while, I nearly bought a similar one on holiday last year but I didn't have space in my luggage so finding it on their site was a real treat. I was really swayed by the mustard version but the french blue shade just won out, it even has the old style ringer.. pow! the print is one of a set we picked up from urban outfitters, I've just popped into an old frame I picked up at a local charity shop! I've suddenly become fond of old frames so I'm always on the look out for them lately. 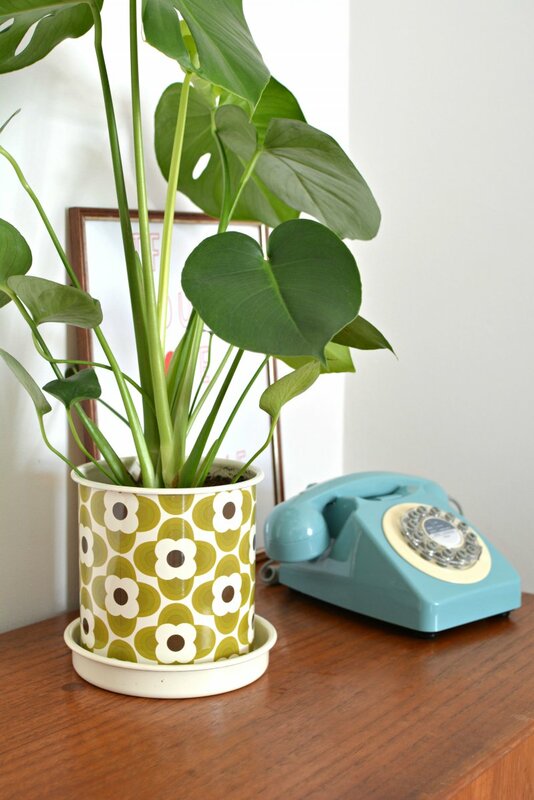 this orla kiely plant pot is just a dream, how pretty is this design? I'm always drooling over her catwalk shows but she also has the most wonderful home accessories range full of bold retro prints, I think this sits really well with the vintage furniture. I'm considering staining the sideboard darker as the wood is a little brighter than I'd like and I'm still undecided on how to decorate the rest of this space, maybe a gallery wall or some shelves? I also have an urge to paint the floor boards white in this room, I have dark floors everywhere else in the house so I'm tempted to have one room different... I probably should have decided before I moved everything in aha! do you love old furniture as much as me? The plant pot is so pretty! absolutely love the sideboard! I'm currently in an IKEA filled house but am hoping to gradually find more pieces like this to replace the IKEA ones with! 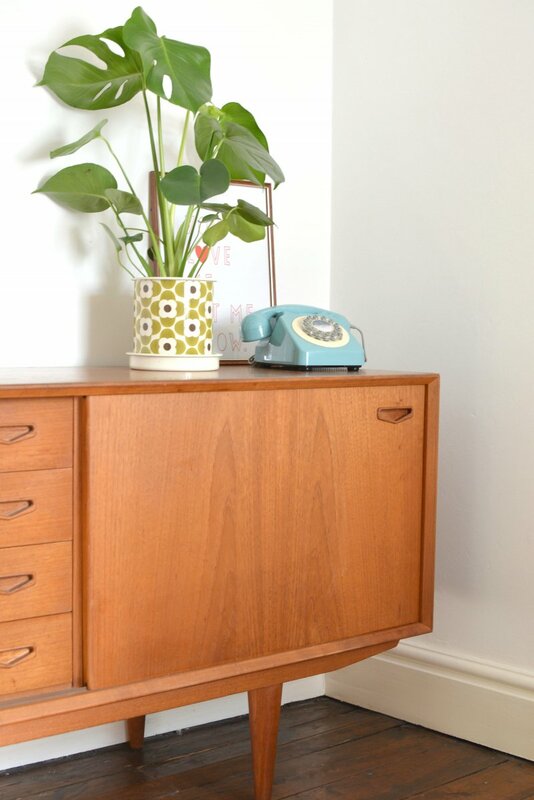 Oh wow, that is my dream side board - I am obsessed at the minute, absolutely love any mid-century. Definitely worth doing the clear out to fit it in! Love this, would look great with some pastel coloured panels on odd bits! This is so pretty and I love the decor. You have a great sense of interior design. Great photos, this decor is lovely! Love love loveeee this sideboard. I remember my grandparents having one and I would love to have one now! If only I'd known that in my teens and kept it!! I love mid century furniture! Is just completely stunning. Is it teak?